Meanwhile place the flour and baking powder into a bowl. Add the cream and whisk well to make a thick batter. Add the peas and stir through. Season, to taste, with salt and freshly ground black pepper. Carefully place spoonfuls of the batter into the hot oil and cook for 1-2 minutes, until golden. Remove with a slotted spoon and drain on kitchen paper and serve warm. 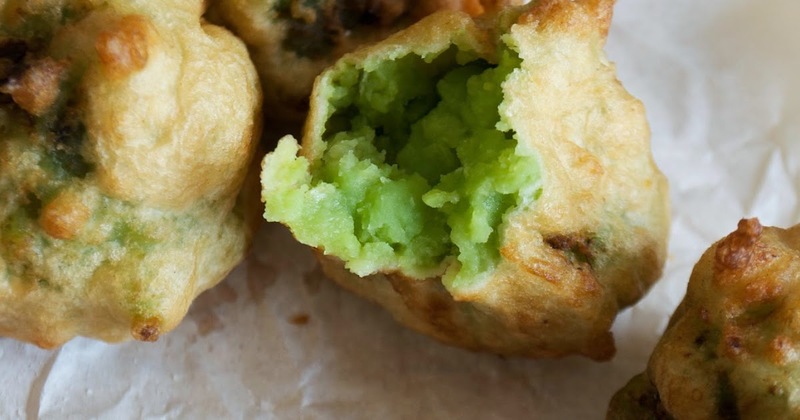 They can also be made by putting the pea mixture between 2 slices of potato and then coating with the batter. Adding onion to the pea mixture gives it a different taste too.